Onboarding emails are probably one of the most important types of email you will send to your clients and leads. Often a part of drip emails campaigns, onboarding emails are usually triggered by specific actions, e.g. a user has signed up but hasn’t bought anything from you, yet. Basically, these automated emails are meant to get the recipient “on board”, as well as nurture customers. To get an even better idea of what onboarding emails are, we’ve prepared some good examples for you. Let’s begin! 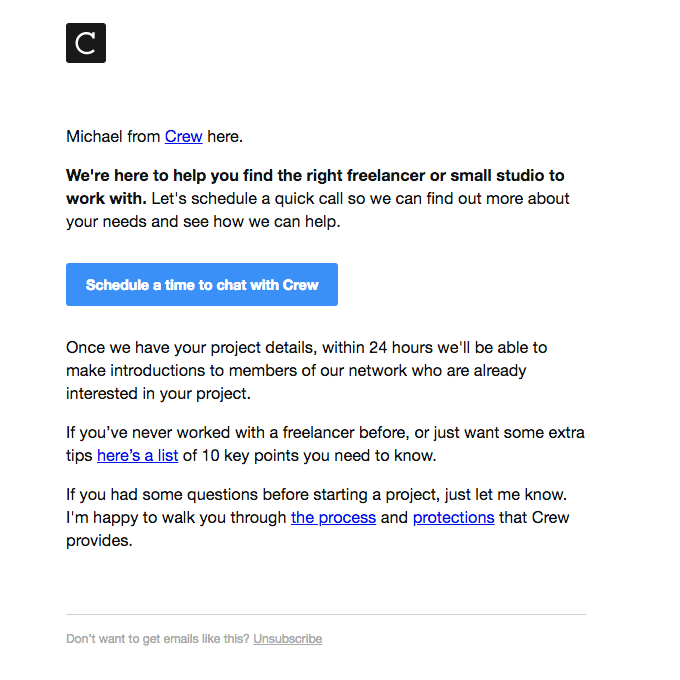 Crew has some pretty good examples of onboarding emails which politely prompt the lead to turn into a client. 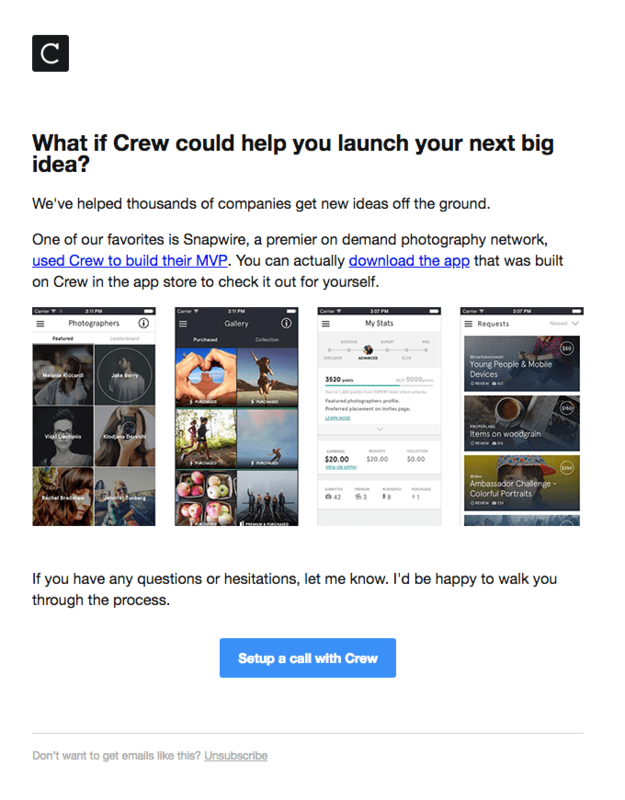 The following example with a subject line “Top talent is waiting” kindly reminds the recipient that Crew can help them launch their big idea and gives them a few examples for proof. 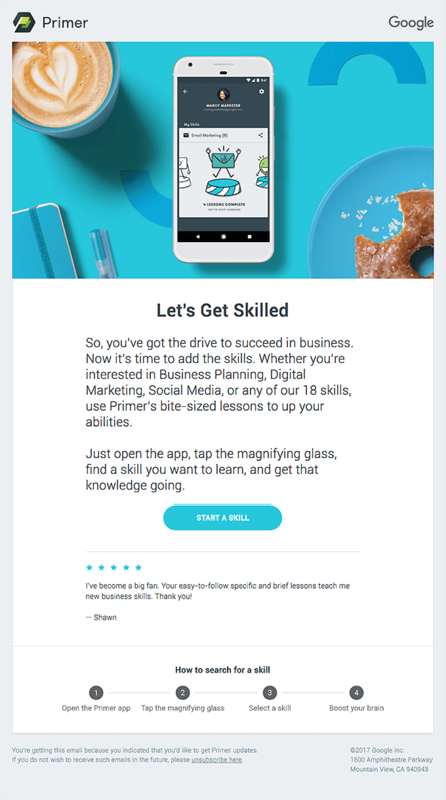 “Let’s get your project started” is a personalized example of an onboarding email where the sender is no longer perceived as the brand but the person behind the brand. This is a good practice which works for those recipients who prefer a more human-to-human contact. Besides the main call-to-action button which naturally draws the eye and prompts the recipient to convert, there are a few more links available if the recipient seeks a further information. This one comes with a subject “Re: Next Steps” which naturally means the correspondence has already started and the person will be highly inclined to open this email. The email is sent when the recipient has started setting up a project on Crew but hasn’t finished it, yet. 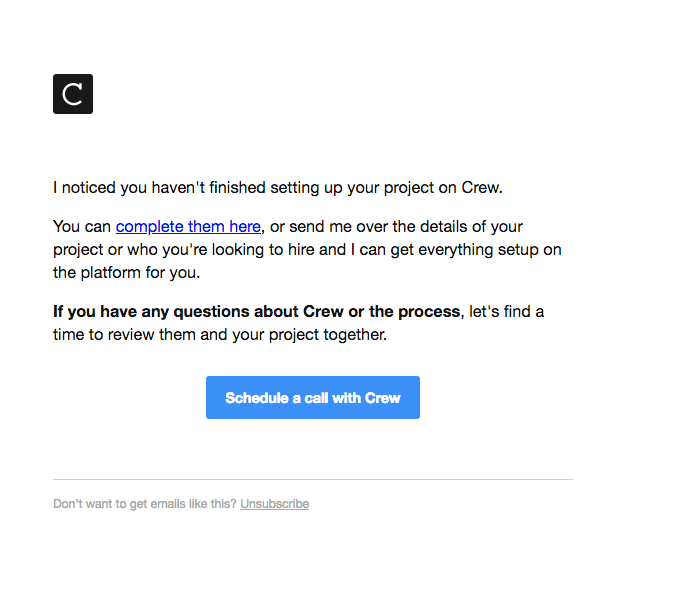 This onboarding email presents two options: the user to complete the setting or call Crew for assistance. 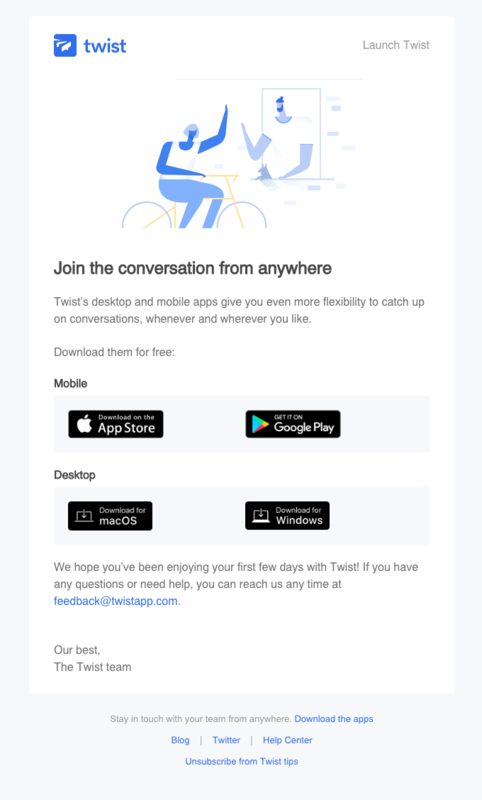 While Crew used pretty much the same call-to-action button for all their onboarding emails, Twist uses different tactics for each of these triggered emails. 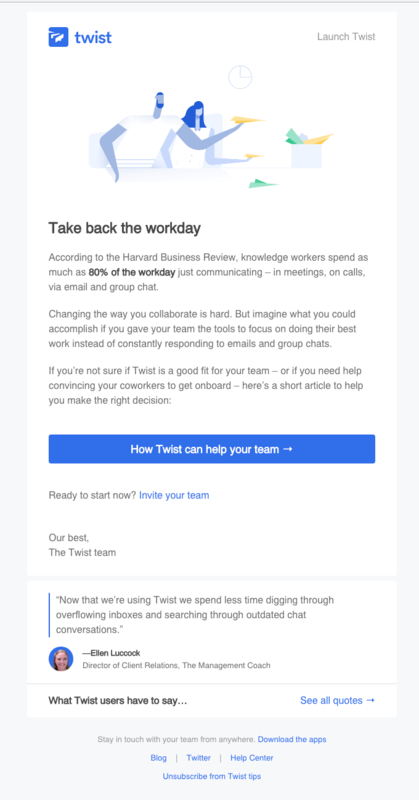 This email comes with a subject line “Does your team spend 80% of their time doing this?” and is more of an education email meant to give lead more information about how they can benefit from a partnership with Twist. There is of course, a secondary option for those who feel ready to start without further information. Twist definitely bets on educational, not too salesy onboarding messages. This one is called “The possibilities…” and focuses on the main benefit of using Twist. 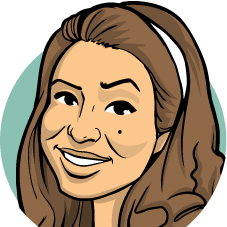 Moreover, it presents just one big call-to-action button leaving no room for distraction. 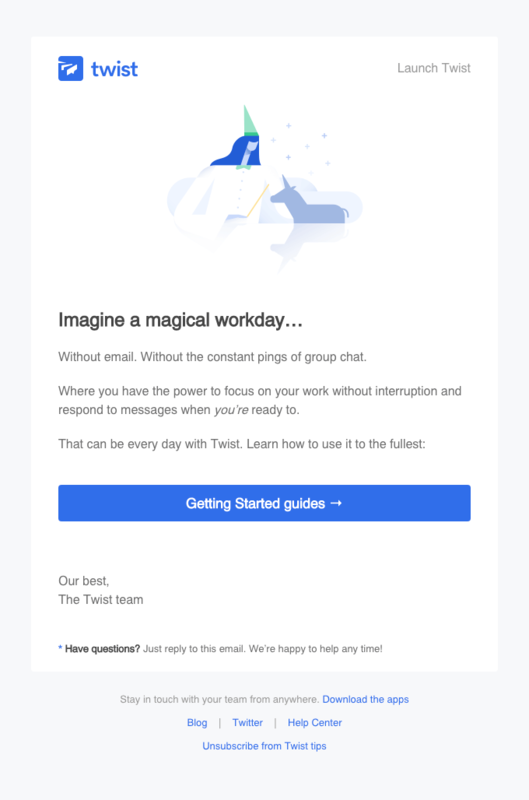 This onboarding email is a part of the drip email campaign and comes with a subject line “Take Twist with you”. The email is automatically sent a few days after you have already started using the service. 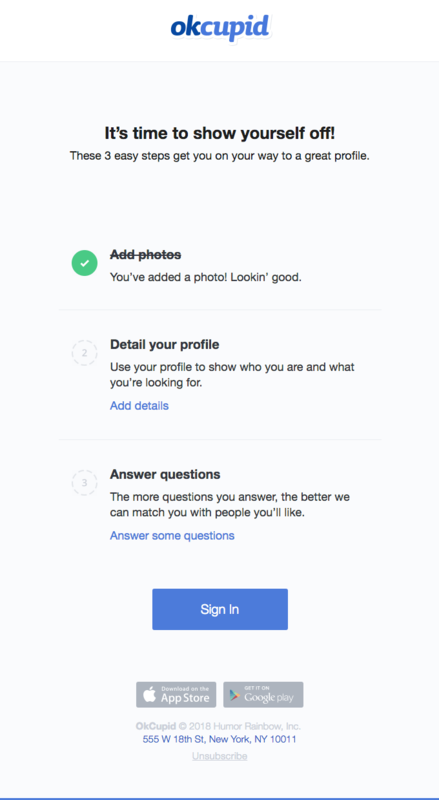 Here is a cool example of onboarding email by Okcupid prompting the recipient to complete their profile information. The email presents a few steps of a process, the first one of which is clearly completed. The words “easy steps” and “great profile” encourage the user to convert. 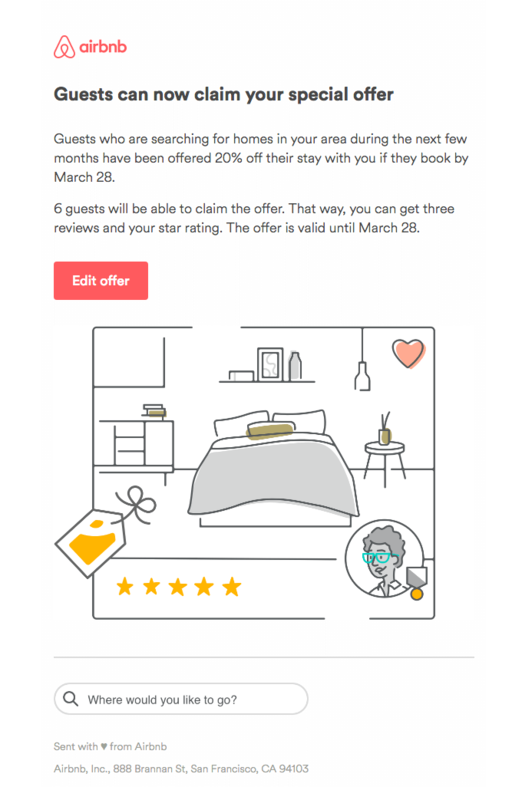 Airbnb personalizes almost all of their onboarding emails just like in the following two examples. 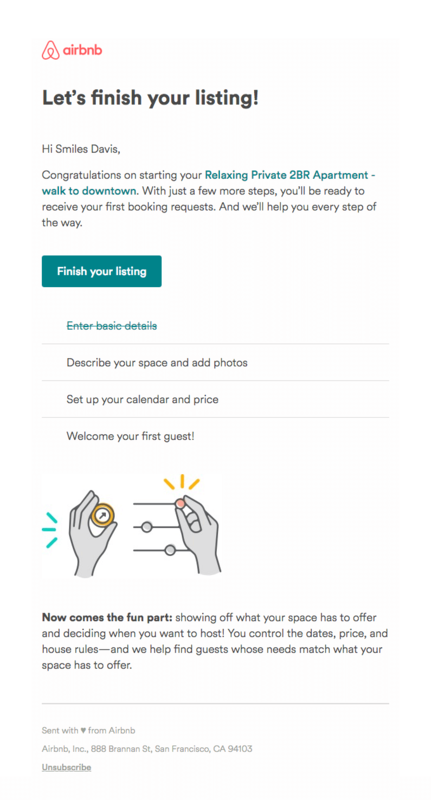 “Host your first Airbnb guest this weekend” email suggests that it has been sent after the user has already filled in basic details. The email aims to guide the recipient through the process of creating a listing on bnb. 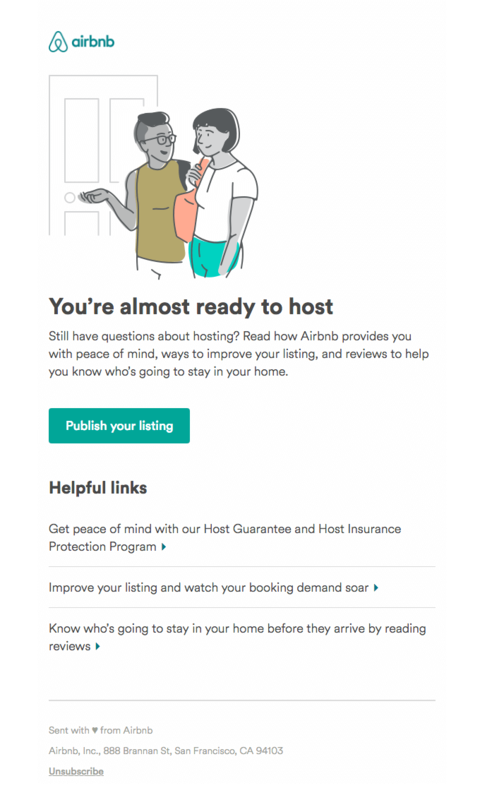 Using the same call-to-action button as the previous email, this one convinces the user to finish their listing by using other hosts’ opinions and feedback. This one comes with a subject line “Are you ready for your first guest?”. Here is an onboarding email suggesting that the recipient has completed a few steps before and is ready to publish their listing. Besides encouraging, the email is also educative since it provides links with useful information. Once you publish your listing, you automatically receive the next triggered email called “Congratulations! Your listing is published.” It contains helpful information about how to make your guests feel at home. Here is another one prompting hosts to update their listing. 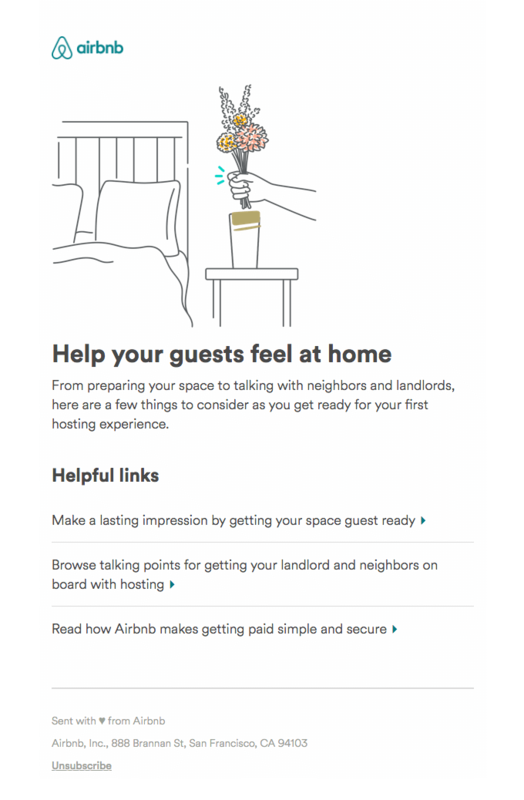 Called “Your 20% offer’s been sent to guests!”, this onboarding email aims to keep hosts stay active. Not all examples of onboarding emails are text-based. Here is one by StubHub which uses quite much visual material to turn leads into clients. Most onboarding emails are received when the user has signed up but hasn’t started using the service, yet. Here is a great example by Tinder whose onboarding email includes a step-by-step guide on how to start using their service, or in their words – how to “Tinder like a pro”. Whether you are sending onboarding emails or other marketing emails which are longer than the fold, it’s always a good idea to repeat the call-to-action button, so the user doesn’t have scroll back up. This is what Facebook did in their onboarding email for Facebook Business. Here is onboarding email by Primer triggered when someone signs up in their platform. They bet on a high-quality attractive hero image, short copy, and a compelling call-to-action button. Here are 3 examples of onboarding emails by Google Analytics using the same call-to-action button for all copies “Sign up for Adwords”. 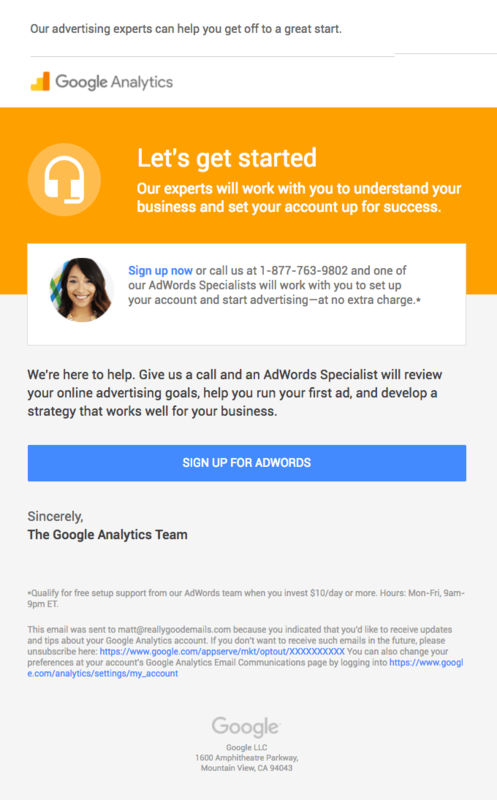 This one is the shortest and comes with a subject line “We’re here to help you succeed with AdWords”. It assures recipients that they can count on help from Google professionals and prompts them to Sign up. This one is a bit more informative, giving you useful advice to apply to your website. If you look closely, you will realize that the call-to-action button is repeated via using anchor text the second time. This onboarding email version comes with a subject line “Get ready to advertise online”. Here is an onboarding email by GA which uses the same call-to-action button but a quite different copy. This version is educational, highlighting the most important benefits of using Google Adwords for your website. The subject line here is “Take charge of your budget”. 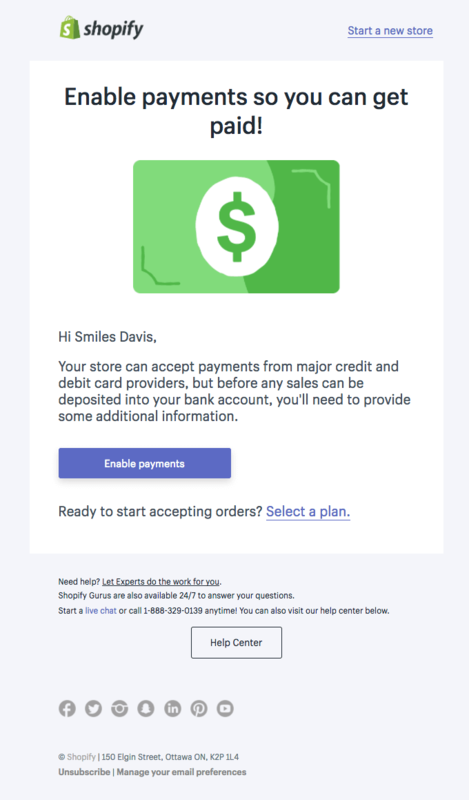 Here are several onboarding emails by Shopify automatically triggered by different actions. Note that all are personalized with the recipient’s name. 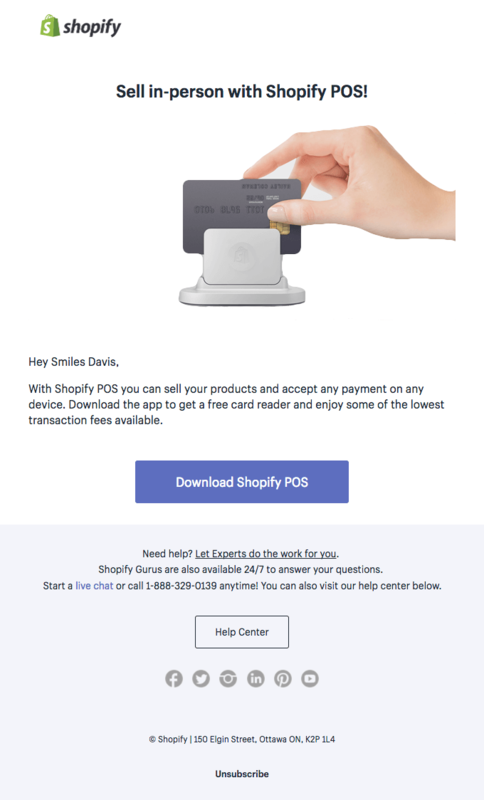 The following email comes with a subject line “Don’t have any products to sell?” and is meant to fuel recipients with ideas that will help them get started with their online store. This one comes with a subject line “How to collect your profits” and it requires additional activity in the recipient’s account. It kindly prompts the recipient to enable payments while giving information why this activity is important. The next one is “Everything you need to sell in-person” and it informs the recipient about an additional opportunity that will help them realize more sales. 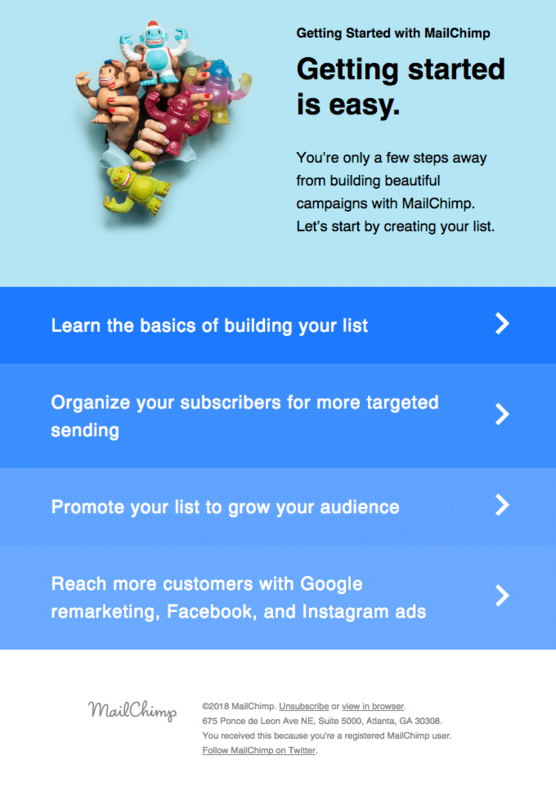 Here is a cool onboarding email “Getting started with MailChimp”. The team made it really informative and educational. Recipients had 4 options to choose from arranged by importance from dark blue to light blue. Have ideas on your mind? We strived to include various examples of onboarding emails to fuel your mind with ideas. Note that onboarding emails are indeed very important into converting your leads into clients, so you shouldn’t neglect them. We hope we’ve been helpful! If you have anything to say on the subject, we’d love to read about it in the comments below. Wanna check out 35 Creative Welcome Email Examples?